Do you dislike the new questlog/worldmap hybrid introduced in Warlords of Draenor? Then this addon could be for you! LegacyQuest provides the "double wide" quest log from Mists of Pandaria as an alternative to Blizzard's new worldmap/questlog hybrid interface. Pressing the Toggle Quest Log button on your keyboard ('L' by default) or on the mini menu on your action bars will bring up LegacyQuest's questlog instead of the new questlog. 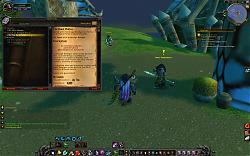 The new questlog is not overwritten by this addon and it can still be accessed from the small worldmap if you so wish. There are no options for this addon. Simply install and go! Classic Quest Log is what I wanted Legacy Quest Log to become. This project is discontinued for the time being. Thanks for letting us know your decision! ETA: Actually, I just found http://www.wowinterface.com/downloads/info23118-ClassicQuestLog.html which seems to do the same thing, and is updated for Legion. So um. nvm? Last edited by Barleduq : 07-23-16 at 01:00 AM. Hello! I really like your addon as the new interface is peculiar and not intuitive for me. 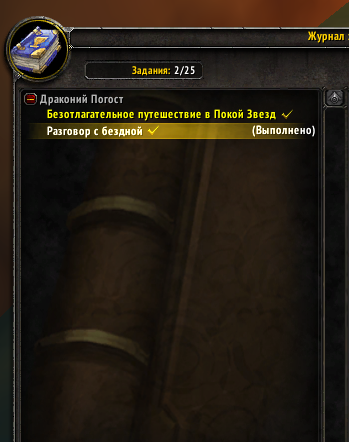 new quest log is awful so this addon is a must have. When clicking on a quest in the objectives tracker, it pops up a single-wide panel with the quest description... could you make this open the full quest log with that quest selected instead? I believe I can but I left it this way as I'm pretty sure it was the same behaviour in Patch 5.4. Thanks for the wonderful addon, it's well appreciated! Pre-patch, WoW automatically untracks completed quests, this function has unfortunately been removed by the 6.0.2 patch. Is this something that could be added? I use nevcairiel's Quester addon to do this for me. It is possible for me to add this to LegacyQuest but I recommend you look at Quester first. I'll admit LegacyQuest's code is a bit of a mess, but it does not touch the tracker at all (other than using official Blizzard API to add/remove quests to/from the tracker). Feel free to send me your taint log. Also, I used the name "Quest Log Simulator 2015" because I felt like being silly. I'm sorry it caused confusion. I am happy someone did this, but unfortunately it has an issue. It somehow taints the UI preventing using quest items from the quest tracking display. The quest item works for a while, and then it gets stuck with each click causing the disable/ignore popup for LegacyQuest. I don't know the exact circumstances for it to happen, but I've been able to get it to happen repeatedly (though not on demand) during the Klaxxi intro quest "Nope." I have a taint log (taintLog cvar set to 2) saved if you would like. I'd also suggest to have the addon's title in the TOC match the folder name. It took me forever to find "Quest Log Simulator 2015" when disabling everything else to make sure it was this addon's issue. I was wondering if it would be possible to get the old options brought back for the quest log visible on the screen? My friend said she used to be able to control when ? quests showed up or not (I never used that option so I'm not sure exactly) but I do notice WoW no longer as the by difficulty options included with the proximity as far as listing the quests goes. Is this something your Addon would cover? How do i get quest level in square brackets, like on screenshot? I don't have it, but I was having it before 6.0.2, really odd, cause I don't change any settings, that's related for that. Any help? Right now, it's only available if you enable Colourblind Mode in-game. You can find it in Main Menu -> Interface -> Help. I do plan on adding level display as a feature though.